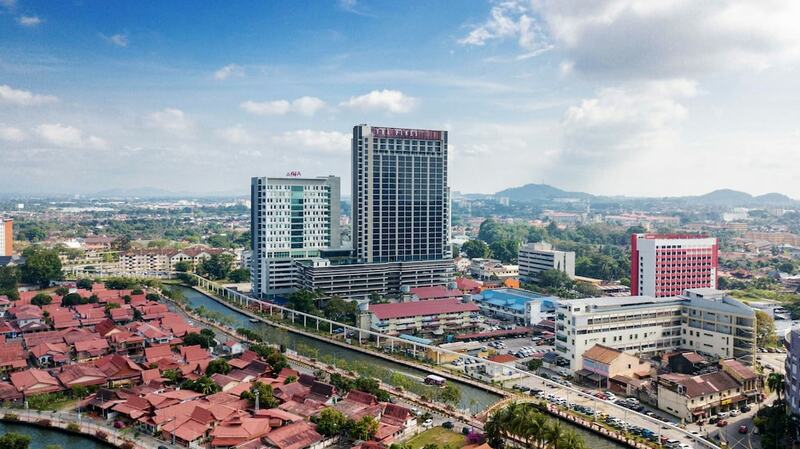 With a stay at The Pines Melaka, you'll be centrally located in Malacca, within a 10-minute drive of Jonker Street Night Market and A Famosa. This 4-star hotel is 1.4 mi (2.3 km) from Mahkota Parade Shopping Mall and 1.5 mi (2.4 km) from Dataran Pahlawan Melaka Megamall. Make yourself at home in one of the 390 air-conditioned rooms featuring minibars and flat-screen televisions. Complimentary wired and wireless Internet access keeps you connected, and satellite programming provides entertainment. Bathrooms have showers and complimentary toiletries. Conveniences include safes and desks, and housekeeping is provided daily. Enjoy recreational amenities such as an outdoor pool and a 24-hour fitness center. Additional features at this hotel include complimentary wireless Internet access, concierge services, and wedding services. Guests can catch a ride to nearby destinations on the complimentary area shuttle.